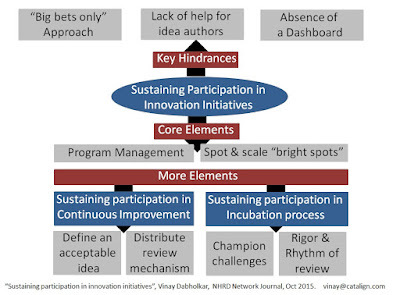 I got an opportunity to write an article on “Sustaining participation in innovation initiatives” which appeared in NHRD Journal, Oct 2015 issue. This was a special issue on “HR in innovative organizations” edited by my friend Rishikesha Krishnan. In this article, I would like to summarize the paper in brief. You can read the full paper here. Key hindrances: One of the key challenges that organizations face in running innovation programs is sustaining participation. People participate enthusiastically in the beginning. However, the energy is slowly dissipated and is replaced by apathy or cynicism. What are the key hindrances in sustaining participation? The paper presents 3: (1) Big bets only approach – i.e. organizations insisting that innovation is only about big bets. This limits the scope of innovation to a few people and most others feel “It’s not for me”. (2) Lack of help for idea authors: Idea authors especially novices need help while taking their idea from a crude form to an attractive business proposal. The help could be being a sounding board, suggestions regarding prototyping, finding a collaborator, in preparing a business plan etc. If no such helps is available then idea authors may feel frustrated. (3) Absence of dashboard: A simple dashboard can communicate a lot about the progress of innovation activity. On the other hand, a lack of dashboard leaves people clueless. This includes those people who are running the innovation initiative in the first place. What to do? Core elements: The paper suggests that any innovation initiative should have two core elements: (1) A program management function and (2) A focus on spotting and scaling “bright spots”. Program manager (full time or part-time) would maintain a roadmap and run various interventions which may include running a challenge campaign, training workshops, hackathon event, blogging contest, publishing a newsletter, calendarize reviews etc. “Bright spots” are evidences where things may be working in pockets. Program managers should be constantly on the lookout for such bright spots and see if they can be scaled. More elements for “Continuous improvement”: If the primary focus is building creative confidence, then it helps to define what an acceptable idea is. Keeping the bar very high will be demotivating and keeping the bar too low will not generate an interest. Moreover, the review of small ideas needs to happen as low in the hierarchy as possible. Otherwise it can become a bottleneck leading to long turnaround cycles. More elements for “Incubation process”: If the primary focus is on the incubation process, then it helps to run campaigns focused on specific business challenges. Also management needs to give attention in the form of regular reviews and maintaining a rigor for the reviews. Hope you find it useful and I would love to hear your comments / suggestions.